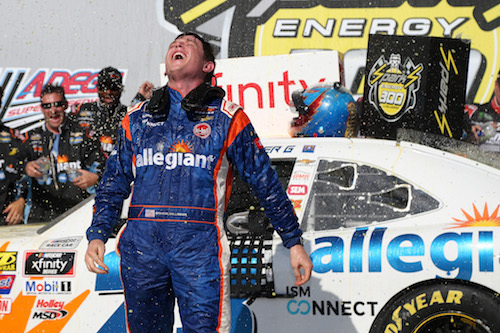 Spencer Gallagher plans to make his Monster Energy NASCAR Cup Series debut Sunday at Watkins Glen (N.Y.) International as driver of the No. 23 BK Racing Toyota. Gallagher is a NASCAR Xfinity Series driver who raced full-time in that series last year and in the first nine races of 2018 as driver of the No. 23 GMS Racing Chevrolet, but he was indefinitely suspended by NASCAR for violation of its substance abuse policy days after claiming his first-career win at Talladega (Ala.) Superspeedway in April 28. He was reinstated in early July but has only driven in one Xfinity Series race since then at Kentucky Speedway in Sparta, soon after his reinstatement, because GMS Racing continues to honor commitments to other drivers made during Gallagher’s suspension. Cup Series driver A.J. Allmendinger will drive the No. 23 GMS Racing entry is Saturday’s Xfinity Series race at The Glen. Allmendinger has 10-career Xfinity starts, the most recent in 2013. He has two wins in the series, coming at Road America in Elkhart Lake, Wisl, and Mid-Ohio Sports Car Course in Lexington. GMS Racing President Mike Beam has submitted a $1.8 million bid for BK Racing. BK Racing is for sale, under an auction that is scheduled to conclude on Aug. 20. Bids are being accepted through Aug. 13. If Beam is the winning bidder, he plans for an affiliation with GMS Racing, which previously considered a move to the Cup Series. GMS Racing fields entries in both the NASCAR Xfinity and Camping World Truck series. BK Racing’s No. 23 team is 34th in the Cup Series owner points standings, heading into the Watkins Glen race. Gray Gaulding, J.J. Yeley and Blake Jones have driven the car in the first 21 races of the season, with Gaulding driving the car in 17 of those races.